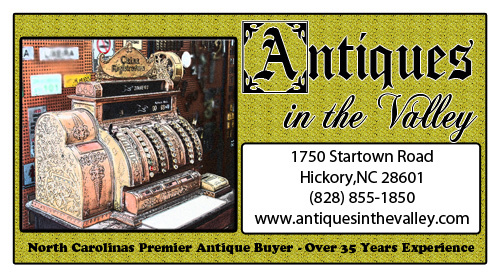 Antiques in the Valley is located in Hickory, North Carolina. We have a professional staff with over 35 years of experience in dealing with antiques. We have a wide assortment of antiques on display and for sale at our Hickory location. In addition to buying antiques, we also offer appraisal and estate sale services. If there is anyone you can trust to provide you with an accurate estimate on your antiques it is Antiques in the Valley. We provide professional discreet service to meet your needs and expectations. Whether you have one piece or an entire house full; we will buy it all. We purchase full estates or partial estates. We buy everything from gold and silver jewelry, coins, war memorabilia, advertising signs, silver, paintings, pottery, quilts, porcelain, and much more. Antiques in the Valley is the only professional Western North Carolina estate liquidation resource you need. Please contact us today so we can further evaluate your antiques. You may come to our shop to speak with us, or we will conveniently ride to your location.